With Charles Darwin’s 200th birthday creeping up on us, we find ourselves pre-occupied with evolution - specifically human evolution. 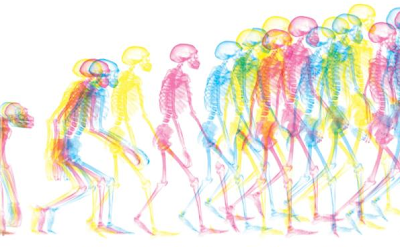 We recently reported that word from the 2009 TED conference was that with the help of a “confluence of technology,” we humans were about to evolve into a new species called Homo Evolutis; a combination of man-and-machine. And now comes the icing on this cybernetic-cake: there is another new theory - set forth in the fascinating book “The 10,000 Year Explosion” - that as opposed to the standard-issue physical anthropological doctrine that human evolution ceased approximately 50,000 years ago... the human species has continued to evolve, and that rate of evolution is actually accelerating. The authors of the book - Gregory Cochran and Henry Harpending - peg the catalyst for this phenomenon on the following Rube Goldberg-like chain of events: the rise of agriculture, mankind’s subsequent abandonment of its hunter-gather ways, the establishment of more permanent population centers, and the resulting here-to-fore unseen population densities ripe for infectious diseases. After all, once everyone started living together - and sneezing on one another - an outbreak of smallpox or the measles would “thin the herd” and - as Darwin himself would point out - only the strong would survive. To paraphrase Woody Allen, we’d like to interject at this juncture: it’s interesting to point out that Cochran and Harpending’s catalyst for human evolution is the advent of Civilization. Now, assuming that their theory is correct - and we sure think it is - the question still persists: where did that Civilization come from? Why - or perhaps more appropriately - how, after hundreds of thousands of years of leading a relatively unsophisticated nomadic existence, did our ancestors suddenly acquire the skills and inclination to cultivate wheat, and then almost immediately thereafter, start building Pyramids? It has long been argued that a previously existing (and perhaps extra-terrestrial) “Higher Culture” gifted mankind with the skills and technology to create the foundations for modern civilization. More on that after the Darwin bash.